Cathy Seabrook, RN, Nurse, Arrhythmia Clinic Southlake Regional Health Centre, talks about the benefits of cardiac rehab programs for patients with Atrial Fibrillation. Atrial Fibrillation and Cardiac Rehab Exercise Programs - Southlake Regional Health Centre Cathy Seabrook, RN, Nurse, Arrhythmia Clinic Southlake Regional Health Centre, talks about the benefits of cardiac rehab programs for patients with Atrial Fibrillation. Cardiac rehab is not just for patients that have undergone any cardiac event, either a heart attack or bypass surgery. We are now referring a lot of patients to cardiac rehab to increase their exercise tolerance, keep them active, and not just sitting on the couch doing nothing because that’s poor for their overall health, their overall cardiovascular health. 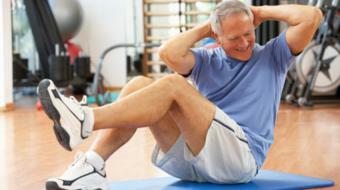 So cardiac rehab exercise programs are great for patients with atrial fibrillation.